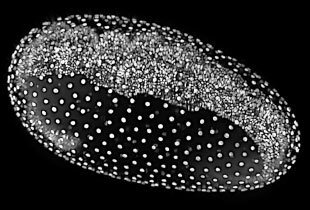 CONFOCAL COMPARE: Scientists built a light-sheet microscope to study the development of Maritigrella crozieri, a large flatworm found in the Caribbean. Their new SPIM setup provided more complete views of fixed larvae compared with traditional confocal microscopy. (Nuclei are stained green. )BMC DEVELOPMENTAL BIOLOGY, doi:10.1186/s12861-016-0122-0, 2016.Last summer, Elizabeth Hillman showed participants in a Cold Spring Harbor Laboratory course the new light-sheet microscope she had invented. Students pulled leeches out of a pond and imaged them wiggling under the instrument, which shoots frames so quickly that the creatures’ quick movements were captured with no blur. “It was a von Leeuwenhoek moment, where we felt like we were seeing things we’ve never seen before,” says Hillman, an associate professor of biomedical engineering and radiology at Columbia University in New York. Since 2004, when the first paper on light-sheet microscopy (aka selective plane illumination microscopy, or SPIM) appeared (Science, 305:1007-09), users of the technique have coalesced into a growing community of enthusiastic biologists. 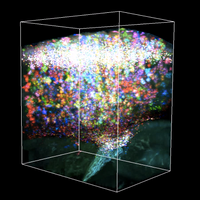 Compared with confocal microscopy, SPIM takes images more gently and rapidly, which allows researchers to track biological processes in 3-D at higher resolution over longer time periods. There are many variations of SPIM, but all use laser light focused into a thin sheet and a detection arm that is oriented perpendicular to the plane illuminated by the light sheet. In most SPIM setups, only the part of the sample that is being imaged becomes illuminated—which basically allows you to optically section your sample and reduce light damage. Researchers commonly use the technique to track developing zebrafish or fruit fly embryos, but in the past few years, new variations have expanded potential applications into areas such as in vivo brain imaging in small animals, cancer diagnostics, high-throughput drug screens, and medical imaging. A basic SPIM system can be assembled for about $50,000, though it can take a year or longer to build and optimize the machine. Using it takes some training: the mounting process is completely different than for a traditional confocal microscope. And the amount of data you can gather in a single run is on the enormously unwieldy level of terabytes. 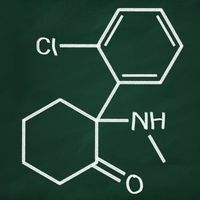 The Scientist asked some SPIM veterans how to get started, what to expect, and what’s on the horizon for this new technique. Here’s what they said. Currently, only a handful of light-sheet microscope platforms are commercially available. Carl Zeiss’s Lightsheet Z.1, launched in 2012, is the newest dedicated system, but more are coming. The Z.1 is geared for a broad base of users studying embryos or small samples of fixed tissue. 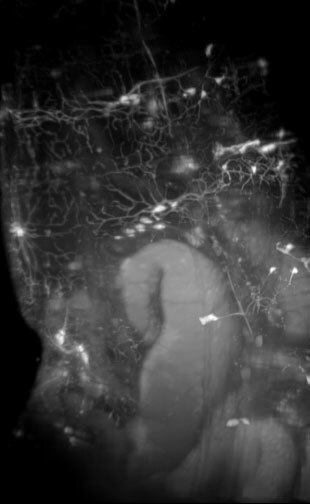 Nipam Patel, an evolutionary developmental biologist at the University of California, Berkeley, considers SPIM imaging as one tool in his toolbox. In three days, he was able to use a new Z.1 to image Drosophila melanogaster, Tribolium castaneum (red flour beetle), and Parhyale hawaiensis (an amphipod crustacean). “I find it very user-friendly on the hardware side. It’s well designed, and it’s pretty easy to get things lined up and get started with it,” Patel says. Girstmair is part of an enthusiastic community of SPIM do-it-yourselfers around the world. Members participate in open-access online resources such as OpenSPIM, an effort launched in 2013 that shows researchers how to build a basic light-sheet microscope and allows them to document their experiences. In general, it takes about a year to build your own microscope and to optimize it, says Lars Hufnagel, group leader in cell biology and biophysics at the European Molecular Biology Laboratory in Heidelberg. Even with myriad resources available online, you’ll probably need help with one or more of the steps, whether from a physicist who can help you customize or tweak a home-built instrument or a bioinformatician to help with data analysis. The first time he used the Lightsheet Z.1, Patel collected four terabytes (TB) of raw data and found that he didn’t have the computational power to access it. Every new user experiences this reality check. SPIM can generate more data in a single day than a confocal microscope produces over the course of a year, Hufnagel says. The ideal data storage setup is a high-speed Internet connection that hooks up the microscope to large servers, where the files could be accessed by powerful computers. Researchers commonly use RAID storage (redundant array of independent disks) that they keep in their lab. To process the data you’ll need state-of-the-art computers with at least 128 GB of memory, says Girstmair. Moving the data can be cumbersome; you’ll need to establish a plan for backing it up. One simple strategy to limit the amount of data you store is to gather the minimum number of images you need for your experiment, says Holly Aaron, director of the Molecular Imaging Center at the University of California, Berkeley’s Cancer Research Laboratory, which has two Z.1s. Everyone thinks they want the highest-resolution data possible, she says, until they find themselves unable to work with it on their laptops or computers. Having to wait for a shared workstation to conduct analyses will slow you down, she adds. Another option is to delete data after processing it, though that’s not always feasible or ideal because the processing algorithms are not perfect, Tomancak says. Still another is to compress the data as it comes off the microscope, he adds. Raw SPIM data is routinely processed using an open source platform called Fiji (fiji.sc). Commercial packages such as Bitplane’s Imaris (bitplane.com/imaris) and arivis’s Vision 4D (arivis.com/en/imaging-science/arivis-vision4d) are developing their own solutions, but these platforms are not cheap, Tomancak says. Avoid the bottomless rabbit hole of reconstruction and deconvolution, Hillman says; stay focused on your ultimate measurement goal, whether it’s counting cells or looking at ratios of one signal to another. 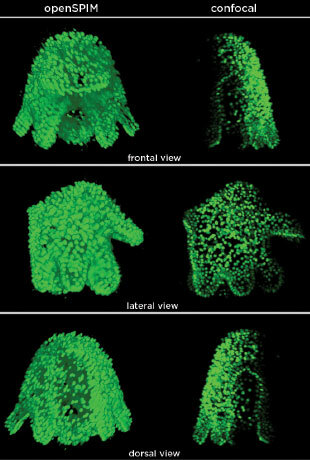 A HIGH-POWER LANDSCAPE: A new kind of light-sheet microscope called SCAPE allows researchers to rapidly image fruit fly larvae. The researchers can immobilize the larvae and slow down their light sweeps to capture high-resolution details of individual neurons.VENKATAKAUSHIK VOLETI, WESLEY GRUEBERSCAPE (SWEPT CONFOCALLY ALIGNED PLANAR EXCITATION). Developed by Hillman and her group, this new imaging technique is geared for capturing fast processes. 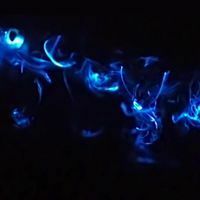 It works so quickly that large motions, such as a zebrafish’s heartbeat, can be captured in a rapid series of frames and stitched together to make a movie. In the intact brains of living mice, SCAPE can image to depths of 200–300 microns, nearly as deep as two-photon microscopy, but with less phototoxicity. Hillman is using it to look at 1-mm-long fruit fly larvae as they crawl and is collaborating with others on a diverse set of animal models. SCAPE boasts a simpler setup than conventional light-sheet microscopy: a light sheet that rapidly sweeps the sample and a single, stationary objective lens for detection (Nat Photonics, 9:113-19, 2015). In theory, it’s possible to assemble a SCAPE microscope based on the original paper, but the group has since developed an improved version, she says. Hillman has recently struck a licensing deal with a major microscope company and will be working to bring SCAPE to the market within the next few years, she says. Her group is also developing another version of the instrument that is geared for clinical uses, such as endoscopy. And they are working on a two-photon version of SPIM for research use that will be able to image even more deeply. LATTICE LIGHT-SHEET MICROSCOPY. Pioneered by 2014 Nobel Laureate Eric Betzig and his group at the Howard Hughes Medical Institute’s Janelia Research Campus, lattice light-sheet is ideal for imaging live cells and embryos at fast speeds with dramatically lower phototoxicity (Science, 346:1257998, 2014). Betzig recently used the technique to observe membrane changes in dividing cells (Mol Biol Cell, doi:10.1091/mbc.E16-03-0164, 2016). Researchers can apply to bring their samples to Janelia Research Campus’s imaging facility, and some scientists are building their own machines, though doing so requires expertise in optics, says Reto Fiolka, an assistant professor of cell biology at the University of Texas Southwestern Medical Center. meSPIM (MICROENVIRONMENTAL SPIM). In a recent study, Fiolka and his colleagues quickly imaged a ball of cancer cells with subcellular resolution in three dimensions (Dev Cell, 36:462-75, 2016). Classical SPIM or lattice light-sheet microscopy wouldn’t have worked for this study, because light sheets as thin as he needed cannot extend over a sufficiently long range. Presently, meSPIM is still too challenging to set up for most labs, Fiolka says, but he and his collaborator Gaudenz Danuser are working to expand its applications and make it more widely accessible. MuVi-SPIM AND InVi-SPIM (MULTIVIEW SPIM AND INVERTED MICROSCOPE SPIM). Hufnagel and his EMBL collaborators have commercialized some of the institute’s microscopes by creating a company called Luxendo, which has received venture capital funding and is now demo’ing its instruments at conferences and in individual labs. Multi-view, or MuVi-SPIM gives four different views, eliminating the need to rotate the sample. Another of Luxendo’s instruments, InVi-SPIM, is an inverted microscope designed to image early-stage development of mouse embryos or other samples that do not survive the sample-preparation process required for traditional light-sheet microscopes (Nat Methods, 13:139-42, 2016).